For Chanukah this year, my ever thoughtful brother bought me this "Snowy Village Cakelet Pan" from Williams-Sonoma (which is unfortunately no longer available). I bought him a robot, so I think it was a good deal. In any case, I've been having a great deal of fun with my new toy. The greatest thing about them is that they look uber-adorable and presentable with the least amount of effort: just a sprinkling of "snow" and you're set. 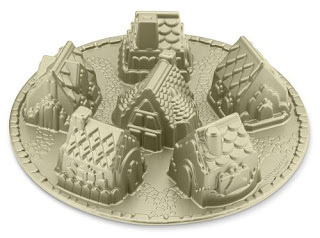 Each of the six "cakelet" molds is unique, with a different roof, chimneys and door. They popped out of the pan with little rounded bottoms, which I sliced off so they all sat evenly instead of wobbling around like Russian nesting dolls. Which of course, meant snack time! ...it was time to bring on the blizzard. Thank goodness I don't have to shovel. (Ha, like I ever shovel). Which is a good thing, since the snow is just getting heavier! Residents are requested to remain indoors. Put some entrepeneurial soul managed to get out to build a snowman. Anywho, I couldn't possibly tell you what cake recipe I used for these since I can't remember at all (and I doubt many of you have a snowy village cakelet pan in your possession). There was a recipe that came with the pan, but I found it didn't make nearly enough to fill them the first time around. So that batch went straight in to our mouth shaped garbage. So...anyone having a housewarming party soon? I have the perfect gift. The recipe filled the pan twice. I baked them for 20-25 minutes at 325 degrees. Hi pearse - I've used other recipes in it - you can use just about any cupcake recipe but the baking times will be different - you'll have to check them more regularly to know when to pull them out. Although with every recipes I've tried, you have to trim the bases to get them to stand upright. Thanks for all of the tips for using my pans. I bought them several years ago, but have never used them. I'm going to this week--for my garden club party. THANK everyone on the comment area.